As with many memoirs, Unto the Daughters is less a history of an honor killing and more a story of the legacy the women of the family were left in the aftermath of a terrible tragedy. Tintori takes readers on her journey in uncovering the long-held, family secret bouncing around in time in a somewhat confused manner, purposely sharing her own difficulty in finding information about her deceased great aunt and her likely early twentieth-century immigrant experience where anything was possible outside of the strict confines of the old culture. Tintori gives a fictionalized account of the immigration of her grandmother’s family. Whether the information is based on her grandmother’s retelling or a compiled likely experience, the author does not specify (which is a theme in this non-fiction work). She characterizes their excitement and fear and how well trained even the little ones were to stay quiet while the adults spoke a language they didn’t understand. Hyperbole abounds in the descriptions of Francesca, the ill-fated great aunt. She was the prettiest of the sisters and the most spirited. It is clear early on that she is doomed to martyrdom in the eyes of the reader. The family makes their way straight to Detroit, Michigan after landing in the United States and going through the landing process settling into an area of the city that is predominantly Sicilian. In their new home, they’re able to live with a semblance of the old country and the daughters are still married off young in arranged unions. The expectation of Francesca was that she would be married very young to the son of a powerful man, but she had other plans involving local barber. Readers going into Unto the Daughters looking for a solid true-crime story will be disappointed. There are rumors of what happened to Francesca, but the author doesn’t have a lot of hard facts. Was her great aunt killed by her brothers, dismembered and dumped in the Detroit River from Belle Isle (the island is a state park with lots of covert places)? Tintori believes she knows but her story is a lot of supposition. In its end, it’s about family pressure and cultural expectations. 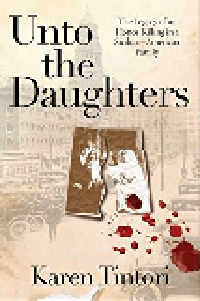 Well written, Unto the Daughters is an emotional read and one that Tintori uses to cleanse herself of a clearly deep feeling of loss of potential. Francesca and her barber become the Romeo and Juliet of Woodward Avenue. As a lifelong Metro-Detroiter (born and raised on the U.S. side and then living on the Canadian side for the last 17 years), I found Tintori’s account of the prohibition interesting and in line with what I know of the era in this area. It was a time for the average guy to get rich. Many of the grandest homes in Walkerville (named for Hiram Walker, of Hiram Walker and Sons Distillery where Canadian Club is bottled today) were built with the money earned from Prohibition rum-running. It was a violent time with great risk yielding great reward. Tintori’s writing style is lyrical and while there are sudden stops and starts they fit with a woman looking for truth and not sure of what she’ll find by patching things together through ambient history. The overriding flaw of the work will be its appeal for some people is that it’s an uncomfortable subject made harder to read through the author’s physical and emotional connections to the subject. The narrative paints a horrible picture of cruelty and selling children into marriage for community status. Well researched, it’s a snapshot of history and a horrible time in one immigrant family and the shame that followed for decades. If you’re looking for true crime, give Unto the Daughters a miss, but it is rather human interest look into a possibly very dark aspect of immigrant life, pick it up today. For more information about Karen Tintori and her work, visit her website. You can connect with her on Goodreads, Facebook, Pinterest and Twitter @KarenTintori.